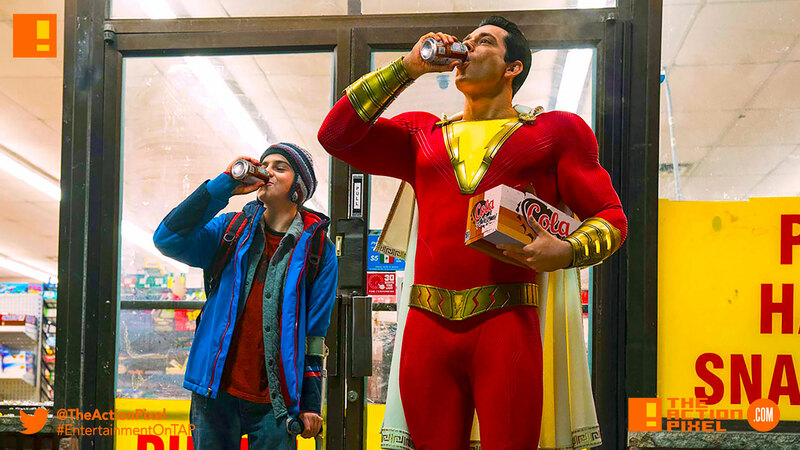 Warner Bros. Pictures brings us to the bodega for a soda pop in the first look image for the coming Shazam! movie. It features Billy Batson’s friend Freddy Freeman and Zachary Levi’s Captain Marvel aka Shazam! I wanted to keep the shorter cape as a throwback to the original because that’s something that sets him apart from Superman or Batman. It makes him feel a bit more Golden Age superhero, which is the vibe I’m going for. Shazam! stars Zachary Levi as the titular DC Super Hero; Asher Angel as Billy Batson; Mark Strong in the role of Super-Villain Dr. Thaddeus Sivana; Jack Dylan Grazer as Billy’s best friend and ultimate superhero enthusiast, Freddy, part of the foster family that includes Mary, played by Grace Fulton; Darla, played by Faithe Herman; Eugene, played by Ian Chen, and Pedro, played by Jovan Armand. Cooper Andrews and Marta Milans play foster parents Victor and Rosa Vasquez, with Djimon Hounsou as the Wizard.